During my first visit to Freiburg, Germany, one of the things that most impressed me was the meticulously cobbled streets. 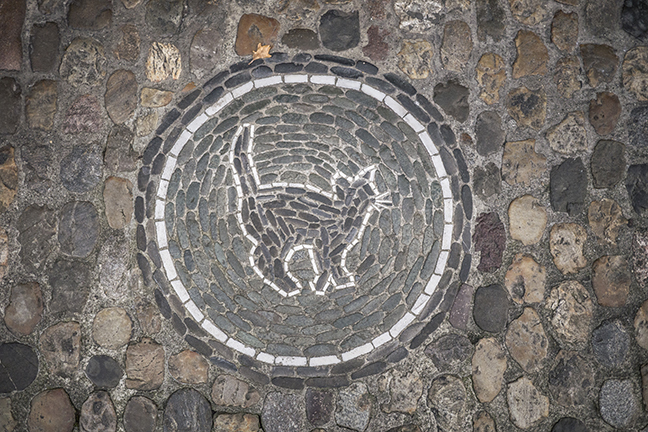 So precisely cut are the stones that you can walk on them for hours without tiring — and the mosaics are as much of a feast for the eyes as the shop windows above them. 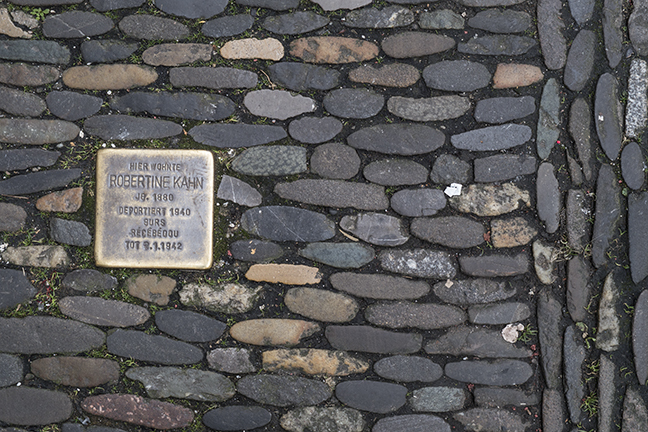 But it wasn’t until a recent visit that I noticed some small brass markers glimmering among the stones. 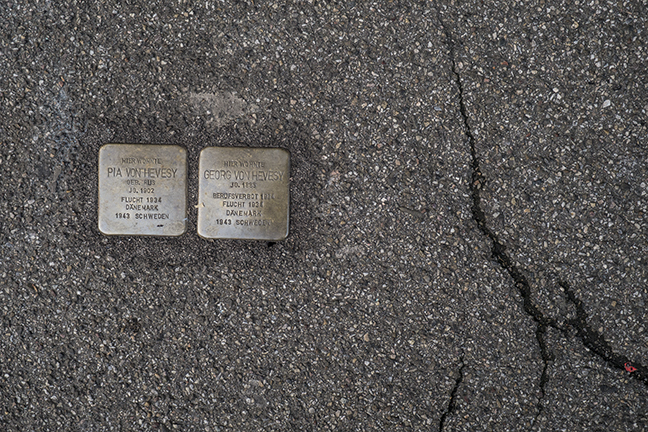 These Stolpersteine — literally, “stumbling stones” — are the work of artist Gunter Demnig, who since 1993 has been placing the small memorials in front of the buildings where Holocaust victims once lived or worked. 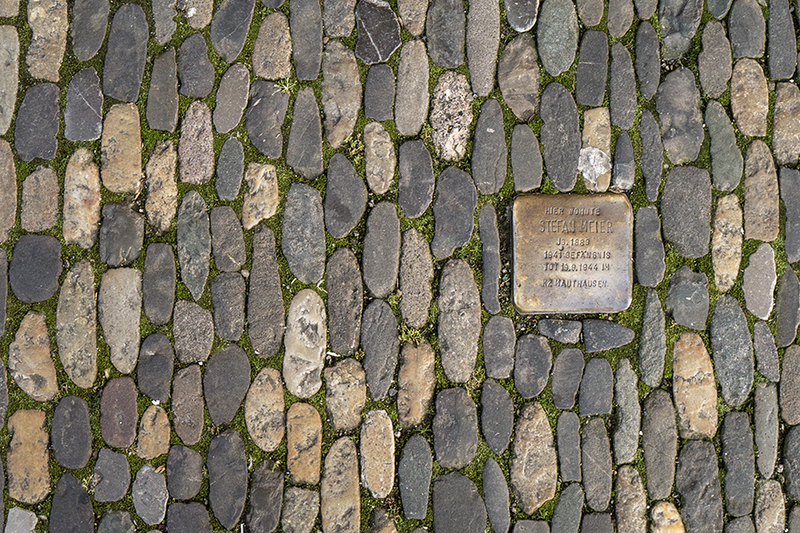 As of August 2014, he had placed more than 48,000 such stumbling stones in 18 European nations. 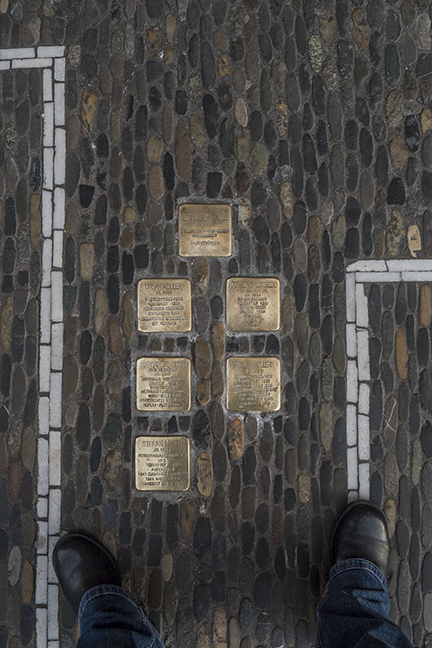 The Stolpersteine list names, dates, and various fates — all engraved simply into each marker. The inscriptions are spare, but the stumbler can still infer the horror. 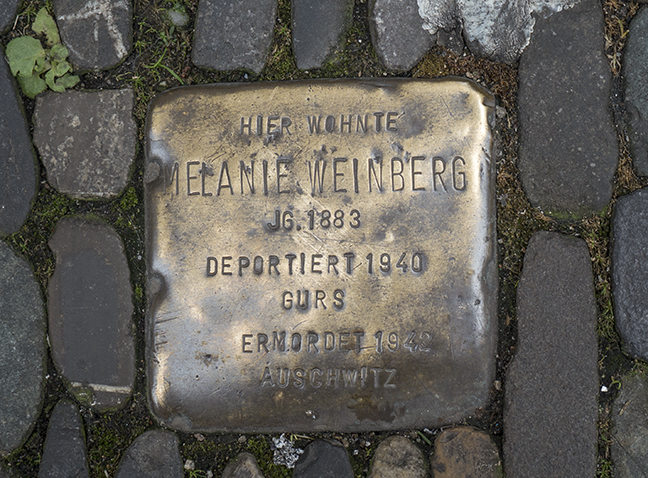 Melanie Weinberg was deported to Gurs, in southwestern France, in 1940. Did she recognize others from Freiburg there? Could she understand her French jailers? And what horrors did she later witness in Auschwitz, before she was murdered in 1942? The stones can’t answer these questions, of course; they can only record the victims’ names. But for Demnig that’s a start. “A man is first forgotten when his name is forgotten,” he said in a recent interview. 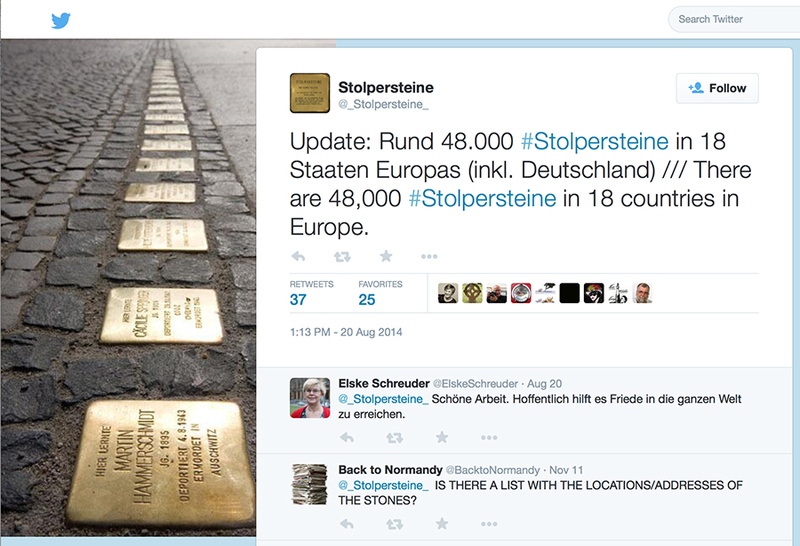 Fortunately, some of the victims the Stolpersteine memorialize — and their stories — did survive. 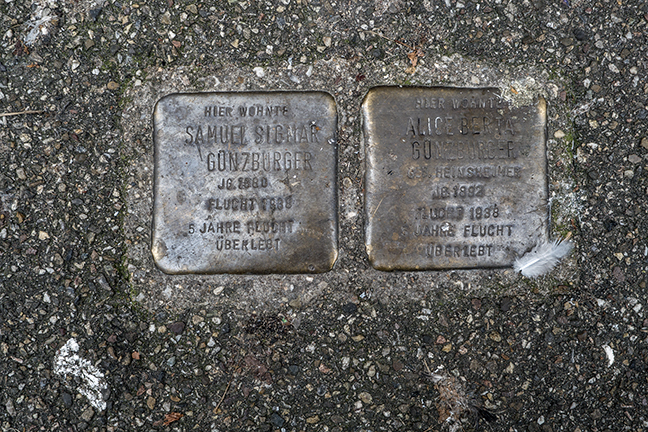 Such was the case of Samuel Sigmar Günzburger and his wife, Alice Berta Günzburger, who abandoned their prosperous business and home in Freiburg to flee the Nazis. 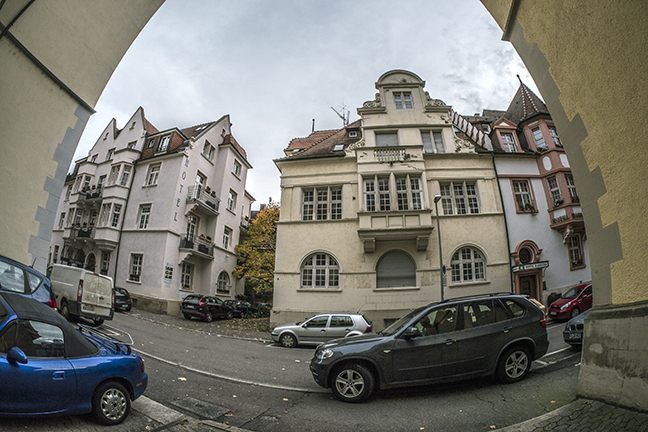 Sadness overtook me as I stood in front of their former home at 6 Poststraße. [New York Times investigative reporter Leslie Maitland] grew up enthralled by her mother’s accounts of harrowing flight from the Nazis. Her book is both a journalist’s vivid depiction of a world at war and a daughter’s pursuit of a haunting question … It is a tale of memory that reporting made real and a story of undying love that crosses the borders of time. But an even greater heartbreak set in as I continued to stumble across more and more names in Freiburg — and as I thought of the millions of others whose stories were brutally extinguished. It’s not all that often that we really see what we are walking on. And when we do I doubt that many things catch the eye the ways these stones do. Nice pictures. Thank you for your photo compliment, Ken! You’re so right that we seldom notice what’s beneath our feet — which for me is part of the genius of this concept. It’s a wonderful reminder that the present is built upon past events, in a very literal sense. Very powerful. Thanks for sharing this moving tribute. It amazes me that Anne Frank was able to say, “In spite of everything I still believe that people are really good at heart.” She is right, and in that light, we need to keep the lives of so many of the good people alive through such memorials. Thanks. What a beautiful quote you’ve added to this conversation, Patti. Thank you — and thank you for your kind words too. Thank you for that. 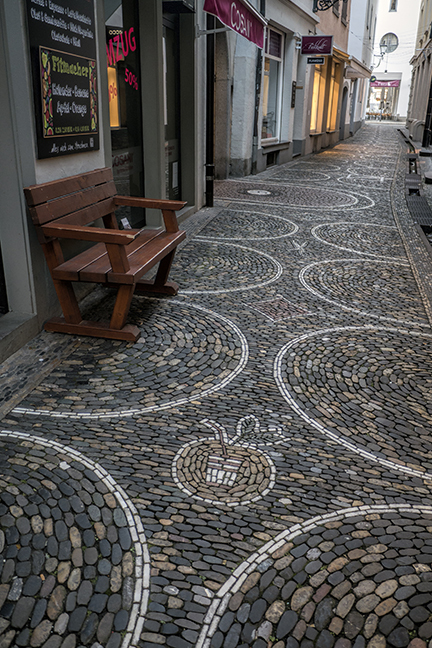 The ‘stumbling stones’ are a wonderful idea – embedded in the town, like stitches in a tapestry. I think the fact that they’re low down and that they glimmer, will make a lot of children, far far into the future, ask their parents to read what’s written on them. And so the names will be passed on, as long as the stumbling stones last. I agree with Ken, by the way – gorgeous photos, arranged perfectly to hold hands with the story as it moves forwards. How beautifully you write! I love your metaphor of those stones “embedded in the town, like stitches in a tapestry,” and your lovely description of how the photos and the story “hold hands.” Thank you for that. Strong and informative stuff! Thank you for telling us about the ‘Stolpersteine’. I live in Switzerland, and will look out for them on my next visit to Freiburg. 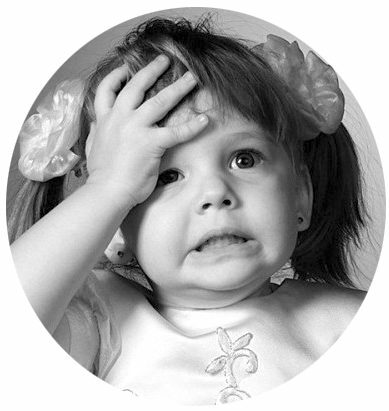 Great photo story telling too; I agree with all former commenters! Thanks for your very kind comment! I’m honored that you enjoyed this post. Though I must apologize I didn’t make it clear I was talking about Freiburg, Germany. (I always forget there’s “another” Freiburg …) My apologies, but I’ll update my post accordingly. In any case, thank you so much for reading and especially for reblogging. 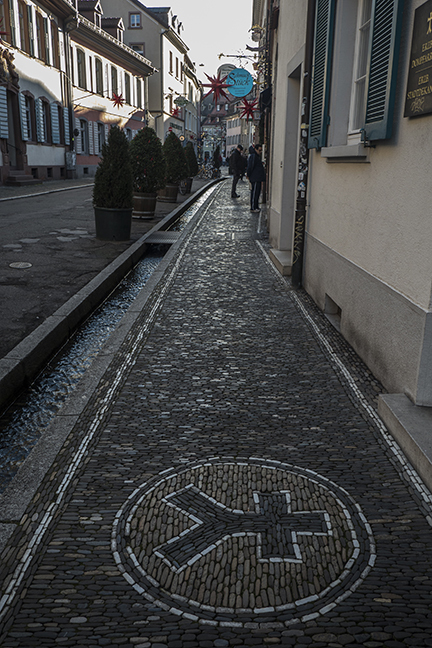 Fascinating and sad fact about the streets of Freiburg, Switzerland. Thank you SO MUCH for reblogging my post! I’m very sorry I wasn’t clear that I was talking about Freiburg in Germany, though. I’ve updated my post, and my apologies for any confusion. Where DO you find these fascinating gems?! What an extraordinary story. Perhaps I will write about Curt and his “daughter” Curta next year. Thank you, thank you! It was the serendipity of the internet sea, washing Curt up on my private beach on the same day as I read your post. I love the serendipity of the Internet sea! I also love the idea of “dialects” within specific populations of sign-language speakers. Our world is such an endlessly fascinating place — in great thanks to wonderful people like you! Thank you. 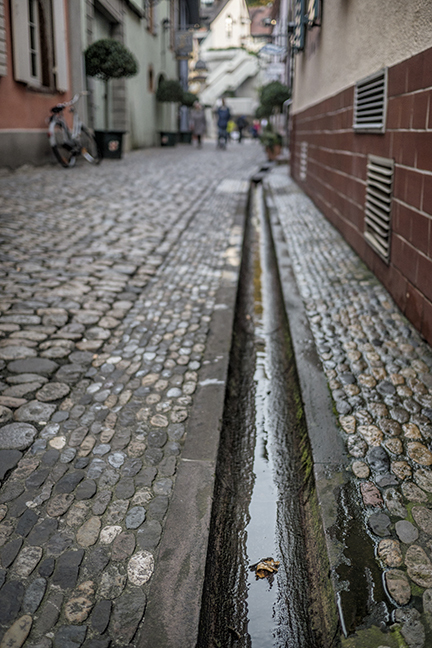 On a lighter note, did you know the old wives’ tale that if you step into one of the many street-side canals (like one of those in your photos above), you will be destined to marry someone from Freiburg and stay here for the rest of your life? I love stone sidewalks and roads. There is something very classic about them and it just makes you feel like the community really cares about the presentation of their home. Beautifully said, Zully: And that was exactly the impression I got in Freiburg … people there really care about their home. Thanks for stopping by! I have never heard or seen these. Well, this is due to it that I have not been to Freiburg. I enjoyed this “special” report very much. It shows to us that walking eyes open is rewarding. Thank You. But you absolutely MUST go to Freiburg, Matti! You would love it — so full of history, but also a very “young” feeling because of the university. I think you would greatly enjoy it. In the meantime, thank you so much for stopping by here!